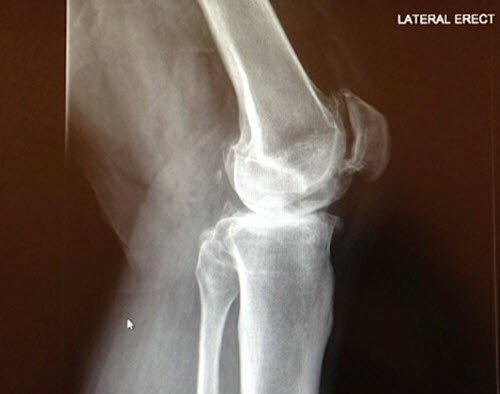 A 52-year-old healthy male presents with severe, intolerable left knee pain that has failed to respond to conservative treatment. 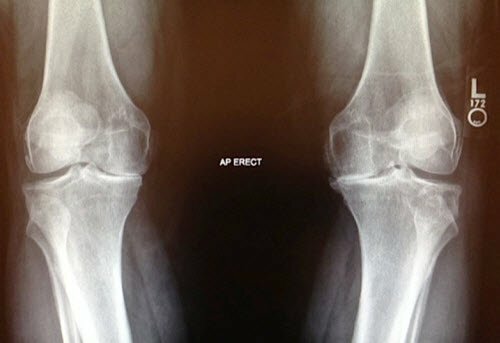 Radiographs show severe advanced osteoarthritis in both knees. The authors recommend total knee arthroplasty, offering him the option of cemented or cementless fixation. As such, TKA is increasingly being offered to younger and younger individuals who would have previously been treated non-operatively. One of the challenges orthopaedic surgeons face with patients under age 55 years who have high activity levels (sports, work, hobbies) is the longevity of the implant and the patient’s expectations. The result of cemented TKA in this population is satisfactory, but there are concerns about aseptic loosening with fragmentation and debonding of the cement. A 52-year-old healthy male was referred to the authors’ practice for severe, intolerable left knee pain. His pain was so severe that it affected his quality of life and activities of daily living, including his ability to walk. The pain, which had been present for several years, did not respond to activity modification, anti-inflammatory medications, pain medications, and multiple series of cortisone and hyaluronic acid injections. The patient reported that his knee felt like it was “giving way,” and he said he had difficulty going up and down the stairs. The patient, a machine operator, was alert and oriented to time, place, and person on presentation. X-rays of both knees and standing x-rays demonstrated severe advanced osteoarthritis in both knees with subchondral sclerosis, osteophyte formation, and femorotibial translation. Figure 1. Preoperative standing anterioposterior radiographic view. Figure 2. Preoperative standing lateral radiographic view. The patient failed conservative treatment. After appropriate medical clearance, he was considered a good candidate for surgical intervention consisting of left cementless TKA. 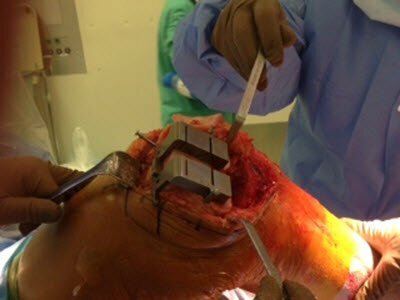 Due to the patient’s age and history, a cemented option was also offered, but the patient concurred with the use of the cementless knee technique. After routine preparation and draping of the patient in the operating room, a mid-vastus approach was made to the left knee (Figure 3a); the joint was exposed and evaluated. Figure 3a. Exposure of the knee using mid-vastus approach technique. Severe arthritis was appreciated, with loss of articular cartilage, exposed subchondral bone, and osteophyte formation (Figure 3b). Figure 3b. Severe arthritis with loss of articular cartilage, exposed subchondral bone, and osteophyte formation. Tibial preparation was done first, followed by femoral preparation. For this procedure, the authors used a Triathlon peri-apatite cementless beaded femoral component, tritanium tibial baseplate, and Triathlon metal-backed patellar component (Stryker Orthopaedics; Mahwah, New Jersey). For tibia preparation, the authors used an extramedullary guide and cut the tibia in 3° of posterior slope (Figure 3c). Tip: This assembly should be aligned over the center of the ankle. Figure 3c. Use of extramedullary guide for the tibia, verification of alignment and slope. Because of the shape of the tibia, the distal portion of the guide will be further away from the tibia than the proximal portion. Failure to recognize this will result in placing the component in extension. The femur was prepared and sized using an anterior referencing guide. The femoral canal was drilled and an intramedullary aligment guide was placed (Figure 3d). Figure 3d. Use of intramedullary alignment guide for the femoral canal. The femoral AP sizing was determined using the skim cut guide. Tip: It is important to align the femoral alignment guide with the transepicondylar axis. The guide should usually have contact with both medial and lateral trochlea for more stability. The distal femur resection was performed using an 8-mm distal resection guide (the distal thickness of the femoral component) (Figure 3e). In some cases, a greater resection may be required (Figure 3f). Figure 3e. Distal femur resection using an 8-mm distal resection guide. Figure 3f. Distal femoral cut. The proper size for the femoral implant was determined by using the anterior referencing femoral sizer. Tip: The wide anterior flange of the femoral sizer should be placed on the resected anterior femur and the feet placed under the femoral condyles so that one foot rests on the most prominent posterior condyle. The sizer is then placed flat against the distal femur. The central post of the sizer will indicate the proper size. Because this is an anterior referencing system, the anterior point is fixed and if the size is between two sizes, the smaller femoral component may be selected as to not oversize the component. 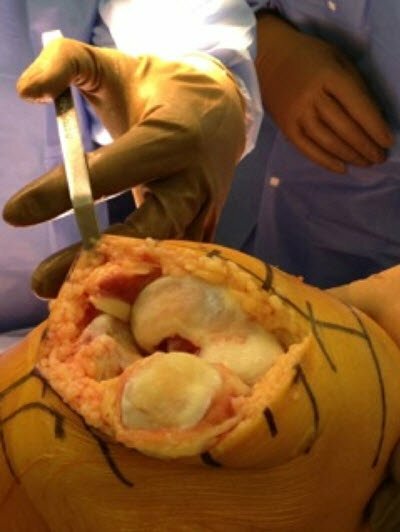 Using the 4:1 cutting the block, femoral anterior, posterior and chamfer resections were done (Figure 3g). This is one of the most important steps in performing cementles TKAs, and the use of a .050˝ (1.25mm) thick sawblade is recommended. This cut must be perfect to ensure a good bone-implant interface. Tip: If not enough anterior bone is resected, consider selecting the next smaller 4:1 cutting block. Figure 3g. Use of 4:1 cutting block for anterior cortex, posterior condyles, posterior chamfer, and anterior chamfer. Ideally, the cut should be flush with the anterior femur. The order of bone resections is not critical; however, a recommended sequence for improved stability of the 4:1 cutting block is: anterior cortex, posterior condyles, posterior chamfer, and anterior chamfer. Tip: Cutting the anterior chamfer last helps to stabilize the cutting guide. It is advisable to pay close attention to minimizing the bias of the sawblade during these resections. All cuts were made using appropriate cutting and alignment guides. The cuts were checked using spacer blocks and alignment rods. Once satisfactory alignment and tibial component orientation were achieved, the CR/CS femoral trial was removed and two headless pins were placed in the anterior holes of the universal tibial template. The tibia was prepared by using a tibial keel punch, then the universal tibial template, the keel punch tower, and the pins were removed as seen in Video 1 and Figure 3h. Figure 3h. 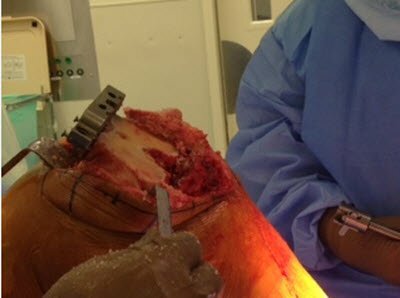 Tibial preparation, to receive the tibial component. 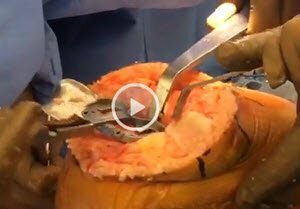 Video 1: Preparing the tibia with a tibial keel punch. Click the player above to active the video. The distal femur was trimmed and prepared to receive a 7 femoral component (Figure 4), and the proximal tibia was trimmed to accept a 6 tibial component (Figure 5). Figure 4. Final femoral component. No space is left in between the component and the bone. Figure 5. Final tibial component. Perfect interface between the implant and the tibia bone. The patella was symmetrically cut using a .050-inch (1.25-mm) non-offset sawblade. Patella resurfacing is optional and is based on surgeon preference and surgeon evaluation of the articulating surface. Tip: Leaving 12-mm of patellar bone is considered a safe amount of bone. 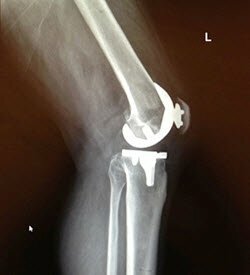 A 35-mm asymmetric metal-backed patella component was utilized in this case for cementless fixation. The metal in the component is cobalt-chromium and is coated with cobalt-chrome beads and peri-apatite (Figure 6). Figure 6. Final patella, cementless and pressed component. An 11-mm polyethylene liner was utilized. The knee was found to be well aligned and stable in both flexion and extension. On a provisional basis, the trial components were inserted. 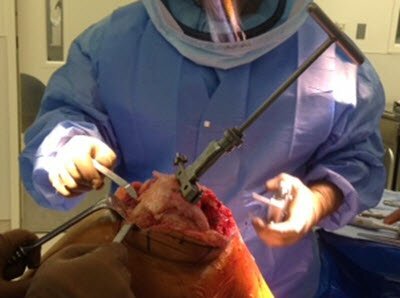 Using the tibial peg drill template, the tibia was prepared to receive the pegs from the prosthesis and the periapatite coated tibia was inserted (Video 2). 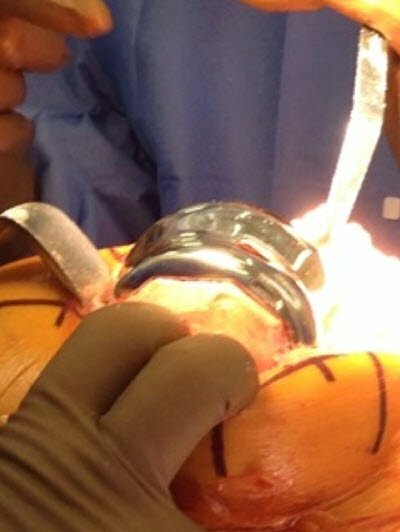 Video 2: Preparing the tibia to receive the pegs from the prosthesis, inserting the periapatite-coated tibia. Click the player above to activate the video. The periapatite coated femoral implant was impacted in place (Video 3) and the patella implant was pressed into the patella using the patella clamp (Video 4). Tip: The implants must be stable and flush with the bone with no gaps present. Video 3: Impacting the periapatite-coated femoral implant in place. Click the player above to activate the video. 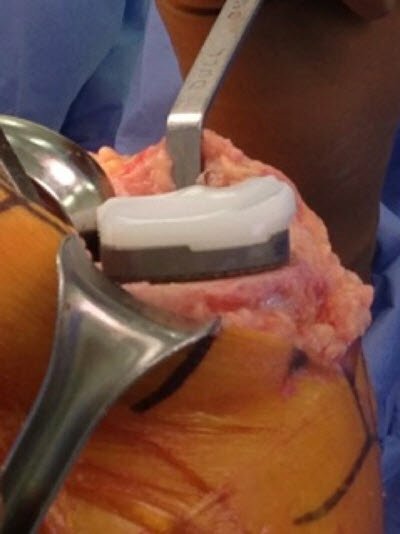 Video 4: Pressing the patella into the patella implant using the patella clamp. Click the player above to activate the video. The knee was again examined with the actual components in place. Good alignment, good stability, and good range of motion were noted. The final x-rays are shown in Figure 7. Figure 7a-b. Postoperative anteroposterior (a, left) and lateral (b, right). Figure 7c. Postoperative Merchant view. Participation in athletics and physically demanding activities are risk factors for developing degenerative knee disease. Severe knee pain due to osteoarthritis is the most common indication for TKA. The authors, however, have experienced an increasing number of young patients who consider surgery and wish to return to prior activity levels. The expectations of these patients are high, so surgeons need to be prepared to place implants that will last for a long time. 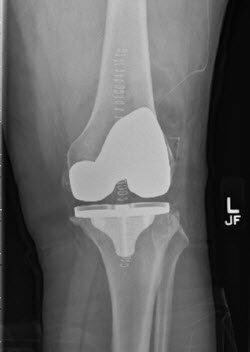 Thus, cementless knee replacement could potentially provide a lasting surgery in this patient population with lower rates of revision. All of the authors’ young patients are given the option of a cemented or cementless TKA, with a full explanation of the advantages and disadvantages of both techniques. For the patient in this case report, the authors recommended a cementless knee due to his age (< 55 years old) and his expectation of returning to sport activities and work as a full-time heavy machine operator. Cementless TKA has demonstrated satisfactory clinical and radiographic outcomes in the mid-term. 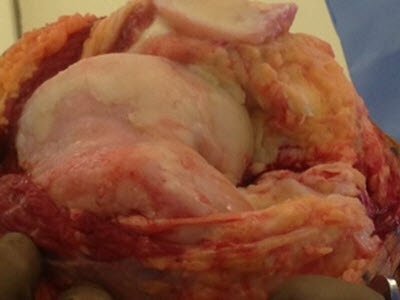 In the population of patients who receive a cementless TKA, the authors recommend extensive patient education that focuses on the risks and benefits, along with realistic expectations. The authors stress the need for regular follow-up with these patients (1, 3, and 6 months, and then every year for the first 3 years and every 2 to 3 years thereafter), encouraging them to report any problems early so they can be addressed immediately. 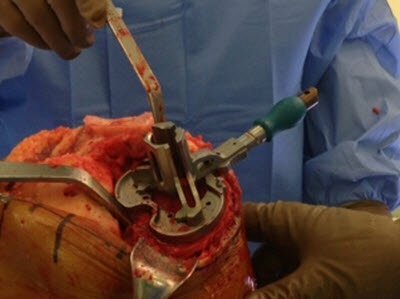 The bone-preserving nature of cementless TKA, combined with the previously mentioned benefits, suggests that cementless TKA is the future of knee arthroplasty, particularly in young patients with active lifestyles. Victor H Hernandez, MD, MSc, and Fabio R. Orozco MD, are from The Rothman Institute, Philadelphia, Pennsylvania. They specialize in adult hip and knee reconstruction. Harwin S, Kester MA, Malkani AL, Manley MT. 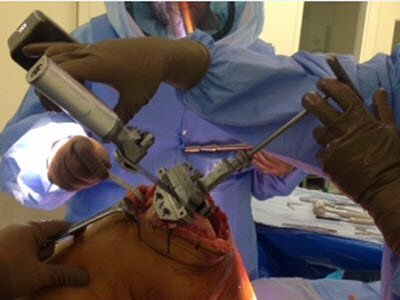 Excellent fixation achieved with cementless posterior stabilized total knee replacement. Journal of Arthroplasty. 2013 Jan;28(1):7-13. Melton J, Mayahi R, Baxter, SE, Facek M, Glezos C.. Long-term outcome in an uncemented, hydroxyapatite-coated total knee replacement. JBJS Br. VOL. 94-B, No. 8, August 2012. 1067-1070. Tai CC, Cross MJ. Five- to 12-year follow-up of a hydroxyapatite-coated, cementless total knee replacement in young, active patients. J Bone Joint Surg [Br] 2006;88-B:1158-63.